Learn to lead in Spearfish, SD. Whether you’re a long time resident or new to our micropolitan community, Leadership Spearfish offers a developmental and educational program. This comprehensive curriculum enriches and encourages potential leaders through a nine-month course. Leadership Spearfish was the best opportunity for me to connect with the community. As a brand new resident, I felt it was a great way to learn the history and connect with community leaders. I wouldn’t have had the courage to sit on a board of directors if it weren’t for my time in leadership. I’ve lived in Spearfish for 12 years, but the Leadership Spearfish program took my knowledge of the city to a whole new level. The opportunity to tour key institutions and hear from many of our civic and business leaders in the community was well worth the time invested. 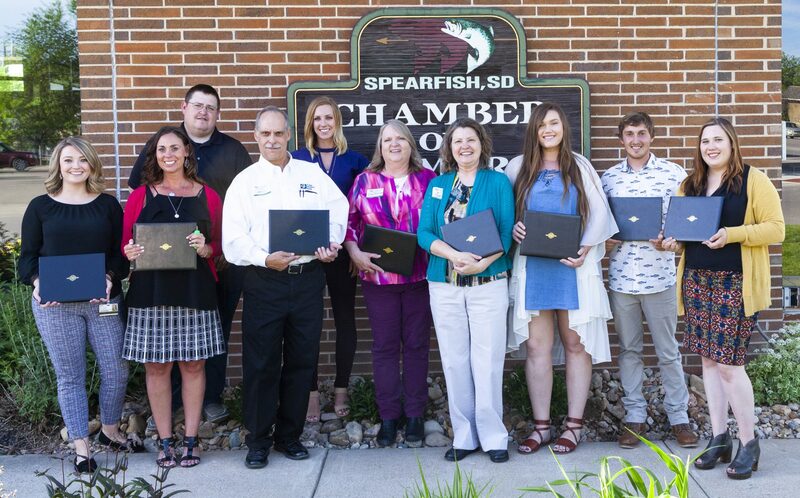 The 2018 Leadership Spearfish Class celebrates their graduation. Front row, left to right: Becky Naccaroto-Eastburn, Regional Health, Julie Gardner, First Interstate Bank, Daryl Knott, Great Western Bank, Cindy Schneringer, City of Spearfish, Beth Haug, Erica Proefrock, Alex Hamaker, Bailey Sadowsky, Spearfish Area Chamber of Commerce. Back row: Eric Skavang, AT&T and Melissa Hampton.